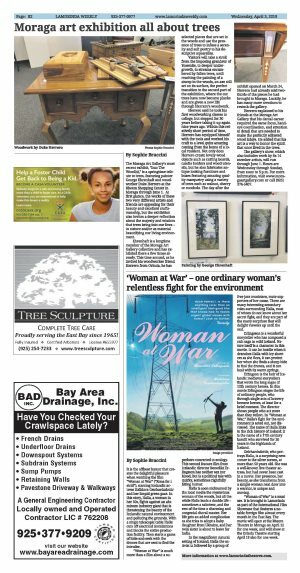 The Moraga Art Gallery's most recent exhibit, "Into The Wood(s)," is a springtime tribute to trees, featuring painter George Ehrenhaft and woodworker Duke Herrero at the Rheem Shopping Center in Moraga through June 1. At first glance, the works of these two very different artists and friends are appealing for their beauty and excellent craftsmanship, but the exhibition also invites a deeper reflection about the majesty and wisdom that trees bring into our lives - in nature and/or as material beautifying our living environment. 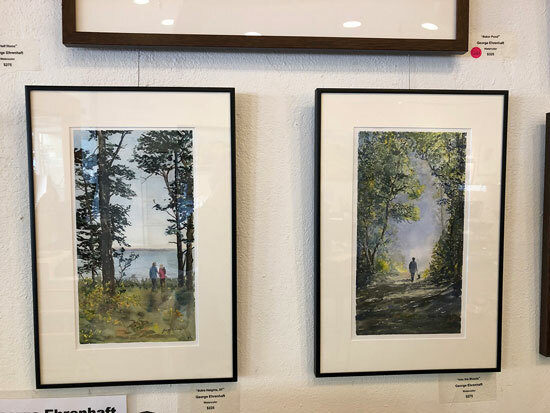 Ehrenhaft is a longtime member of the Moraga Art Gallery collective and has exhibited there a few times already. This time around, as he invited his woodworker friend Herrero from Orinda, he has selected pieces that are set in the woods and use the presence of trees to infuse a serenity and soft poetry to his descriptive aquarelles. Visitors will take a stroll from the imposing grandeur of Yosemite, to deeper undergrowth, to streams encumbered by fallen trees, until reaching the painting of a stump in the woods, an axe still set on its surface, the perfect transition to the second part of the exhibition, where the cut trees have now become planks and are given a new life through Herrero's woodwork. Herrero said he took his first woodworking classes in college, but stopped for 30 years before taking it up again nine years ago. Within this relatively short period of time, Herrero has equipped himself with the tools and worked his craft to a level quite amazing coming from the home of a local resident. 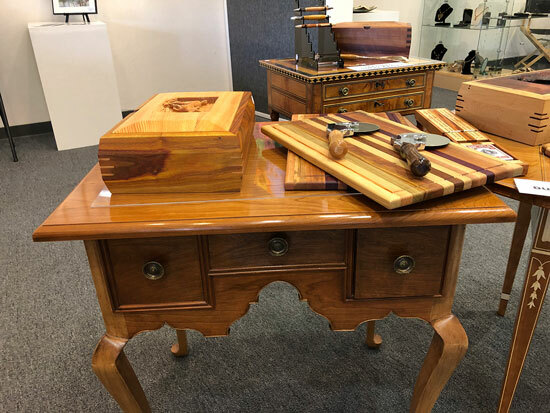 Not only does Herrero create lovely wood objects such as cutting boards, candle holders and wood utensils, but he also fabricates antique looking furniture and boxes featuring amazing quality marquetry using a variety of trees such as walnut, cherry or cocobolo. The day after the exhibit opened on March 24, Herrero had already sold two-thirds of the pieces he had brought to Moraga. Luckily, he has many more creations to restock the gallery. 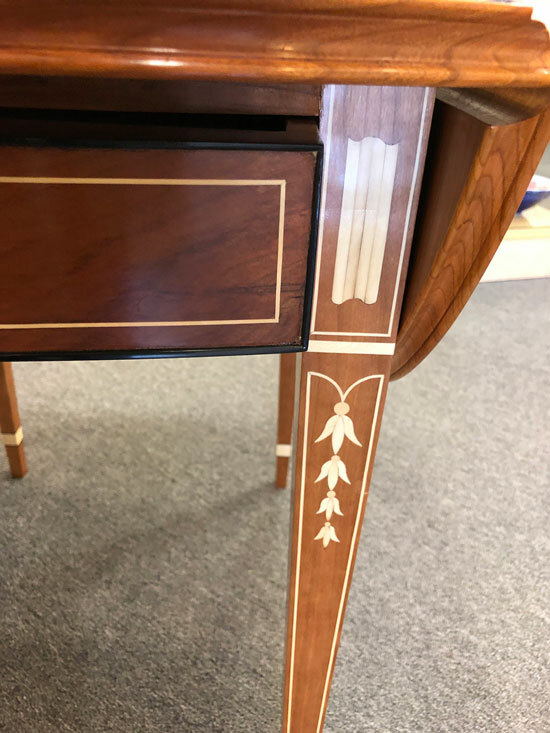 Herrero explained to his friends at the Moraga Art Gallery that his dental career required the same focus, hand-eye coordination, and attention to detail that are needed to make the perfectly adjusted wood inlays. He added that his art is a way to honor the spirit that once lived in the trees. The gallery's show, which also includes work by its 14 member artists, will run through June 1. Hours are Wednesday through Sunday, from noon to 5 p.m. For more information, visit www.moragaartgallery.com or call (925) 376-5407.